Well-known and well-established property developer, DNR Corp, was launching its latest project – DNR Casablanca, a stylish apartment complex in the heart of the IT corridor. They needed both a short-term and long-term creative campaign strategy that would help it stand out in a neighbourhood ripe with stiff competition from leading property developers. We put our thinking hats on and came up with the ‘Walk To’ campaign, leveraging the project’s greatest USP – its universally advantageous location. In a city crumbled by traffic and long commuting hours, having the luxury of a short commute by walk is no small feat at all. Casablanca was surrounded by world-class infrastructure, schools, malls, hotels and offices – all at walking distance. This was its undisputed advantage and we simply had to capitalize on it. The campaign was launched across all channels from radio, print and outdoor to digital and social media. 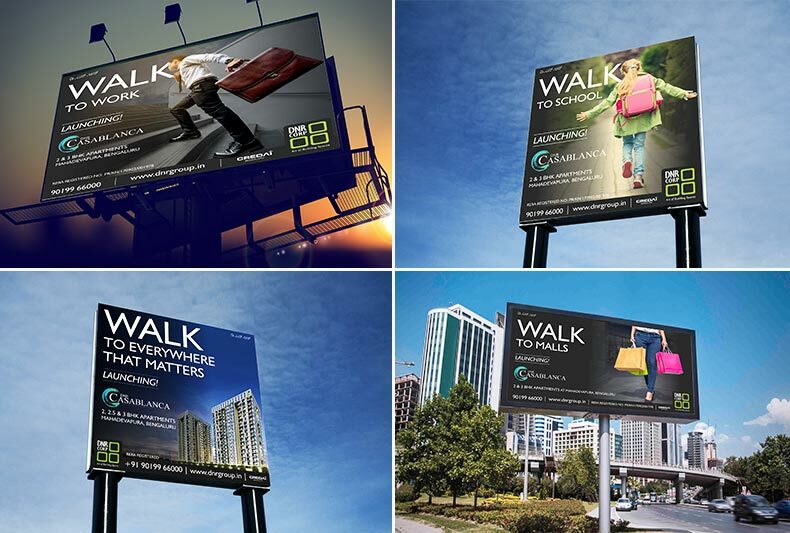 ‘Walk To’ created a massive buzz in the homeowner community, especially the traffic-crunched IT crowd. Lead generation was going strong and steady as enquiries continually poured in. A lot of prospective customers even decided to drop by for a complete walkthrough of the property.